Speaking as a person on the street, possibly from my posterior, I’m going to say that Vincenzo Natali is one of those directors that has really flown under the radar for the past, oh, sixteen years? According to Wikipedia he’s slated to direct the upcoming adaptations of Neuromancer (based on the seminal cyberpunk novel by William Gibson) and High Rise (based on the seminal suburbapocalypse novel by J.G. Ballard) – and, whether true or not, that’s encouraging to hear. Both of these projects play to Natali’s strengths: Claustrophobia, creeping suspense, suburban terror, the interweaving of man and machine, and the weird. He also knows how to make a tight budget stretch well beyond its means. Cube, his first and most well known film (and already a cult classic) was made for a mere $350K. 2002’s Cypher was done for $7 million, which is astonishing when considering how good the movie looks. Splice, 2009’s genetic cautionary tale, was a much bigger affair but still measly by Hollywood standards. With $30 million Natali was able to turn a provocative little horror movie into an opera of squeamish beauty. To this day it remains my favorite of the director’s films and certainly one of the most original horror movies in the last decade. The only strike you can make against Mr. Natali is that his films don’t tend to make much money. Unfortunately, that’s the only strike that matters in this business. People don’t see his movies. 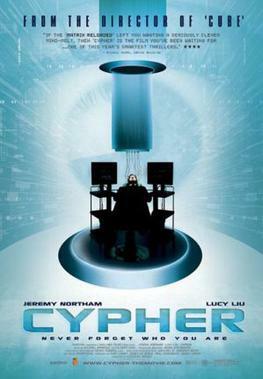 Shall I then point you towards Cypher, a minuscule sci-fi film starring Jeremy Northam and Lucy Liu? It is absurdly convoluted, twisting and turning through a bleak corporate landscape, gleefully propping the spy genre on its head with a goofy protagonist that is one step removed from a plank of wood and just a step to the left of flat-footed. Even summarizing the film would do little to wipe the confusion away, and it would diminish the fun of scrabbling after Northam’s clueless protagonist in search of meaning in the high tech flimflammery and occupational backstabbery. Let’s put it this way: Morgan Sullivan (Northam) is a dweeb looking to join the world of techno espionage. Why? Maybe for the benefits. Maybe because he can’t stand his wife. After a lengthy process of interviewing and application he lands a job as a spy for Digicorp, an immense corporation that seems to manufacture…something important. They’re looking to get a leg up on their rival, Sunway Systems, and to do that they’ll send Sullivan all over the U.S. to boring company seminars in hopes of capturing product secrets. As a spy, Sullivan loves getting into character. Instead of Ginger Ale, he drinks Scotch. Instead of wearing glasses, he smokes cigarettes. Instead of doing nothing, he pretends to golf. He likes the game, whatever it is. But then a beautiful woman shows up (Lucy Liu) and throws his whole world out of wack. This femme fatale is in the employ of Sebastien Rooks, a dangerous entity in the tech world, a man that may be the death of Sullivan – or his last chance at survival. To be honest, the plot of Cypher is a bit of a muddle. You’ll need to watch it twice to really get what’s going on but after that there is little to scream about. After the breathless back and forth of who Sullivan is really working for and what the rival companies are really warring for, much of the weirdness is rather mundane. But, loathe as I am to say it, the plot doesn’t really matter in this movie. What Cypher does well it does in spades, and that’s building an atmosphere of tension and oppression. Northam’s pale dweeb gradually grows from an enthusiastic nothing to a fretting freak, an avatar of the audience’s own desperate confusion, and the transformation is immensely entertaining. As for Lucy Liu, I don’t know what to say. Just as with 2007’s Watching the Detectives, I really have no idea what she’s doing in this movie. Perhaps it’s to lend an indy some A-list gravitas, perhaps it’s because she likes doing quirky no-budgets. My theory is that she took a certain co-star’s insult to heart and this has all been to show Bill Murray that she can too act. She’s not bad here but neither is she terribly invested. I’m not sure what it’s all about. It must be said – and my real purpose in writing this review is to say – that the direction is wonderful in this pseudo-caper flick. Natali took what would be an otherwise pedestrian script and turned it into a beautiful play of grays and beiges, shadowy corridors contrasted against washed out whites. This is, essentially, a cyber noir. And though the plot does disappoint with its predictable elements (particularly the big one), it is the way that Natali lets it unfold that makes the film enjoyable. For the moment the director is still hanging onto the underside of mainstream recognition, but Vincenzo Natali proves with Cypher that a visionary can turn even the plainest lemons into zesty lemonade. But not Cube 2: Electric Boogaloo.